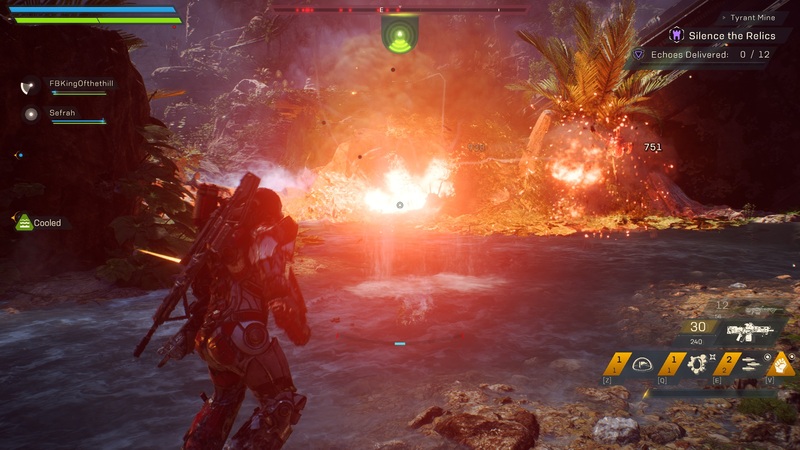 The problem with Anthem is that rocket-boots and mini-rockets are virtually all it has going for it, and the farther you delve into the game the increasingly clear this becomes. 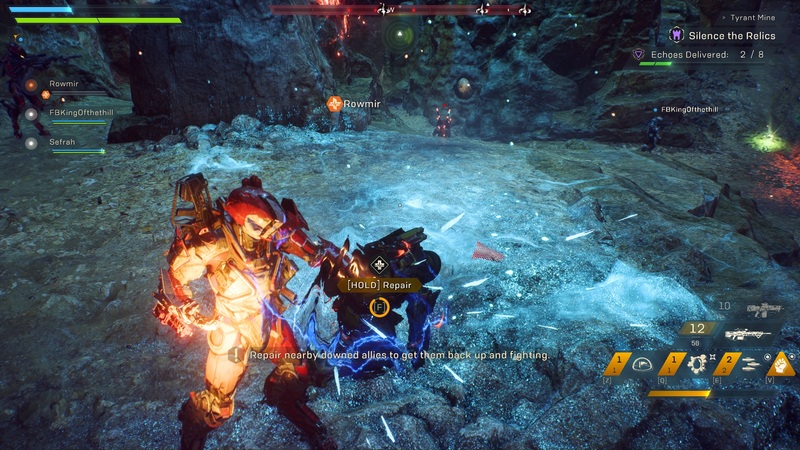 I’ve spent a couple of entertaining hours with BioWare’s latest, but I’ve spent much longer veering between boredom and frustration and bafflement and…what’s that word? Oh yes, despair. Despair that BioWare has shifted from making its wonderful (if sometimes wonky) RPGs to putting out a second-rate Destiny clone. This being BioWare, you’d at least expect the game to have a better story than Destiny, right? Well, judge for yourself. 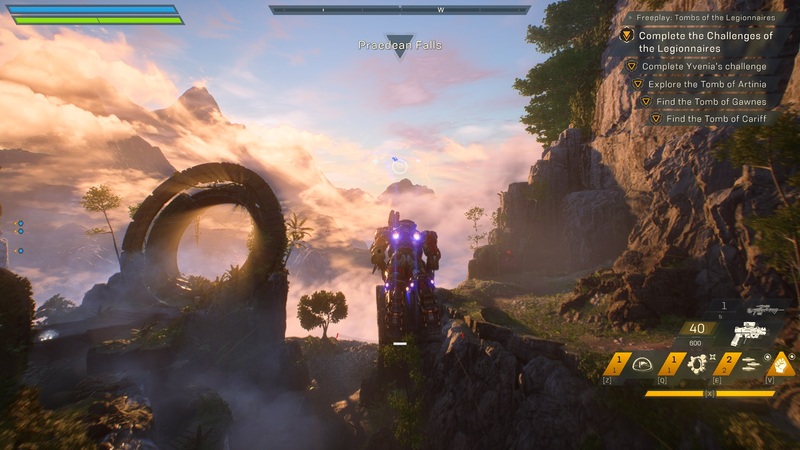 Anthem takes place in Bastion, a hybrid sci-fi/fantasy kingdom on an alien planet that is locked in a constant apocalyptic cycle due to a mysterious force called the Anthem. As best as I can fathom, this is a sort-of cosmic song that spawns demons and makes the ground explode. You know, one of those. Anyway, you play a member of a heroic mercenary group called the Freelancers, who embarks on a mission to stop the latest cataclysm at a place called the Heart of Rage (which sounds like the name of a women-only bikers club). This attempt fails for various reasons, and because of this failure the Freelancers break up and go their own ways, which weirdly makes them more like freelancers than when they were an actual organisation. At this point the story begins properly, with you taking a job that leads you to discover an organisation known as Dominion is aiming to control an object known as the Cenotaph located in the Heart of Rage. 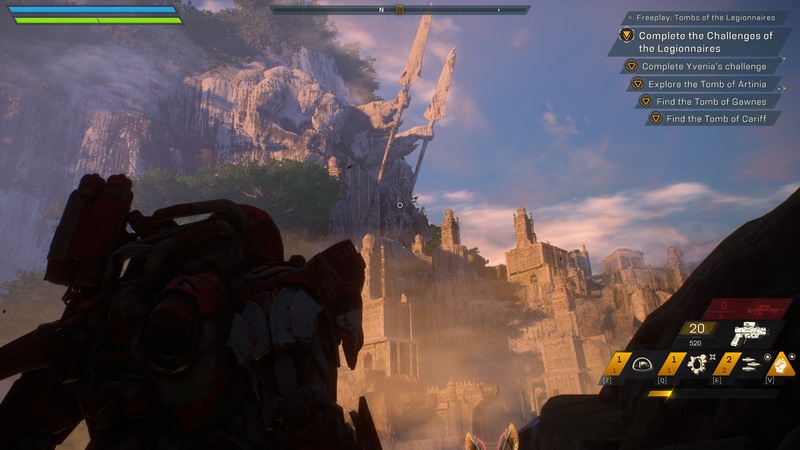 It’s possible that counts as a spoiler, but frankly it’s hard to tell, because Anthem’s own lore is so muddy and confusing that’s its difficult to understand what is going on. Part of the problem is that Anthem struggles to provide a central cast of characters worth caring about. 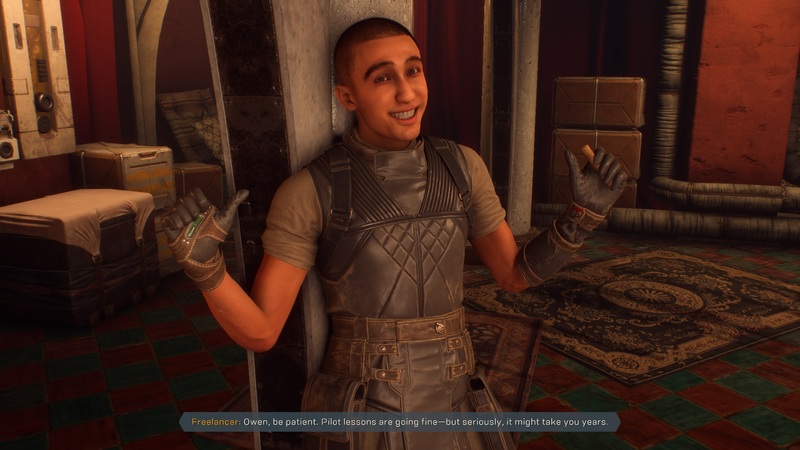 You’re a nondescript Freelancer, while every other “major” character is either a voice in your ear, a slightly uncanny figure in a cutscene, or an NPC lore-dispenser in the game’s hub of Fort Tarsis. 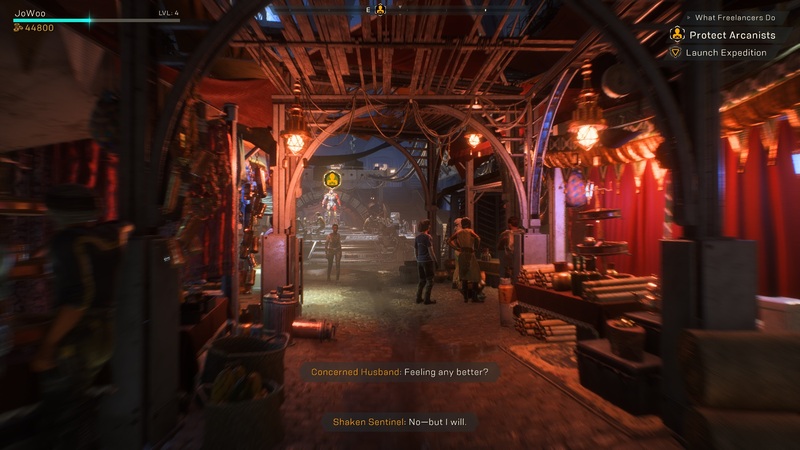 Unlike Mass Effect or Dragon Age, Anthem doesn’t get much opportunity for proper character development, so it attempts to make up for this by turning every character into a quip-generator. I take no pleasure in saying this at all, but Anthem is terribly written, with one-dimensional characters engaged in an endless contest of verbal one-upmanship. Owen is the worst example, an almost pathologically quirky Stephen Merchant impersonator, but nearly all of the characters speak in this clipped, spuriously wacky tone. It’s particularly disheartening to see BioWare laid so low in this regard. But here’s the thing, Anthem doesn’t need a great story to work. In fact, the game is comfortably at its best when you’re as far away from Fort Tarsis as possible. There is enjoyment to be found simply flying around Bastion, which is a phenomenally pretty place that also feels genuinely alien. It’s clearly designed with jetpack navigation in mind, but the result is this wonderfully weird geometric jumble that looks as if a giant has stacked several mountain ranges on top of one another and then smashed it to bits with a hammer, like tectonic crazy-paving. Amidst the tiered cliffs and colossal rock-overhangs, you’ll find mouldering ruins, hidden cave systems, and weird alien structures. It’s undeniably stunning, and if you’ve got an RTX card I imagine that it’s probably the best-looking game ever made. For all that detail, however, Bastion is weirdly lacking in atmosphere, especially compared to Metro Exodus, whose environments have a palpable feel to them as well as raw graphical fortitude. Another issue is that Bastion is very hard to navigate. All those rock walls turn the map into a gigantic maze, and the game has no ability to set custom waypoints, so you spend an awful lot of time bouncing around areas like a weaponised pinball. 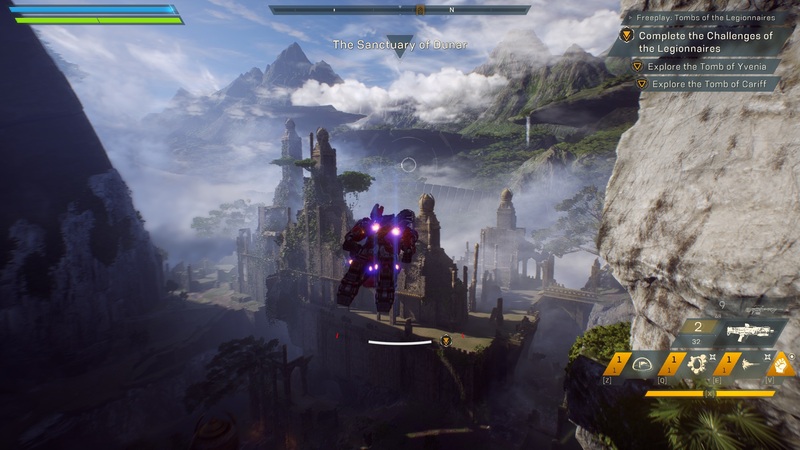 Fortunately, the actual Expeditions (Anthem’s term for quests) point you in the right direction, so you can focus on the business of flying to the mission area and then shooting the baddies. When you’re not stuck, flying is lovely and satisfying. But combat is primarily what Anthem is about, and from a mechanical perspective it’s equally well designed. Whichever javelin you pick, you can guarantee it will be bristling with armaments. I spent most of my time with the Ranger, which I found to have a pleasing balance of speed and power. Anthem’s Ranger lets you carry two standard guns, which include fast-firing machine pistols and explosive sniper rifles. Alongside this you get an assault weapon, which includes missiles, a sizzling heat-ray, and my personal favourite 'venom darts'. There’s a grenade slot, a support ability such as a protective force-field, and the aforementioned Ultimate ability. 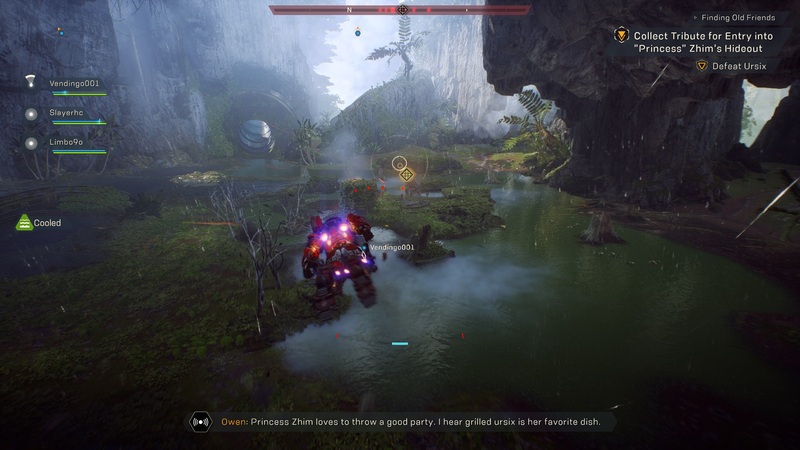 When you combine all of this with the manoeuvrability enabled by the jetpack, Anthem’s combat can be fun. The problem is that the quality is entirely on the Javelin side. Few of your enemies are interesting to fight. In fact, many of them are suspiciously similar to those seen in Mass Effect. (the insectoid scars are almost certainly re-skinned Krogans), while all enemies use the same shield, armour, and health system seen in ME. Unless you’re fighting a boss enemy like the Titan, nearly all fights devolve into shooting repetitive waves of enemies. More problematic is the structure of missions. Almost every mission is the same format of fly a bit then shoot a bit then fly a bit more then shoot a bit, while the same objectives crop up constantly. One involves collecting floating orbs, while another involves collecting pieces of an ancient machine to return to said ancient machine. Another is an insultingly simplistic rotating block puzzle. There’s no craft to any it; it’s just the most basic framework to hang the combat from. You might think, 'Ah, but surely the cooperative element makes up for this!' Well, no, because Anthem isn’t really a cooperative game. You can revive other players and perform some powerful one-two combos, but beyond that there’s little encouragement to work together, and you barely communicate with other players at all. Even the missions are set-up to be read as single-player experiences. It just so happens that other players can tag along. There are so many other problems too. The loot system is massively underwhelming, never offering any surprises, only slight variations on what you had before (until you reach the right level to unlock the next tier of equipment). The game suffers from a whole host of technical issues from ludicrous loading times to horrific texture pop and even geometry pop (although installing on an SSD reduces these issues considerably). Quests will intermittently bug out so you can’t finish them, forcing you to end the expedition prematurely and repeat the whole mission. Oh, and there is one quest that is so badly designed that I’m planning a second article just to cover it. Honestly, it’s a doozy. Some of these latter points might improve; BioWare is already working on the loading issue and the bugs. But it’s unlikely to change the fact that, beneath the stunning visuals, Anthem is a fundamentally dated game. Take away the jetpack and the cutting-edge visuals, and you’re basically playing a rote third-person shooter from ten years ago. Even if everything worked perfectly, Anthem is painfully derivative. 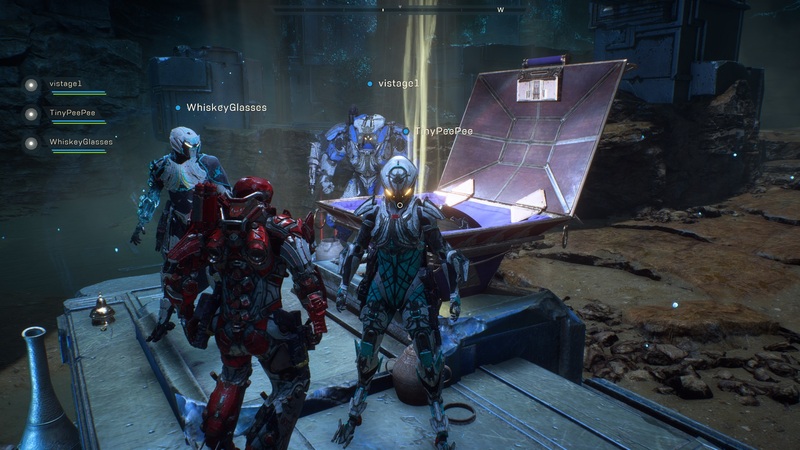 I hoped that I would be wrong about Anthem, because I love BioWare, and even though this isn’t typical BioWare, I like to watch studios succeed in doing something different (see Apex Legends). But I was more right than I expected, which I can assure you is quite a shock. No doubt it will have its defenders, but a nice jetpack and some half-decent combat does not a great game make.